FL was awake when I arrived today, and for a little while I thought it was going to be a good day. He was moving about with his zimmer frame, with guidance from a nurse, and got from the bed to his chair without incident or apparent pain. However, he was soon slumped over his table, refusing to drink the “tainted water”. I offered to get him a drink from the vending machine and he asked for diet pepsi. They only had coke, but he drank half a cup of it. I then remembered bringing in a pot of prepared pears and offered them. He brightened up and asked just to have the juice, no actual fruit. So I strained that into a cup and he drank with obvious relish. But as the day went on he sank lower and lower in his chair and complained more and more of the pain in his ribs as “agony”. I called the nurse, who called the doctor, and they decided to try a heat pad. They are still trying to wean him off the opiate painkillers. They decided to try a Capsis gel – basically they are going to paint him with chilli sauce. It might help with the shingles pain too, so definitely worth a try. 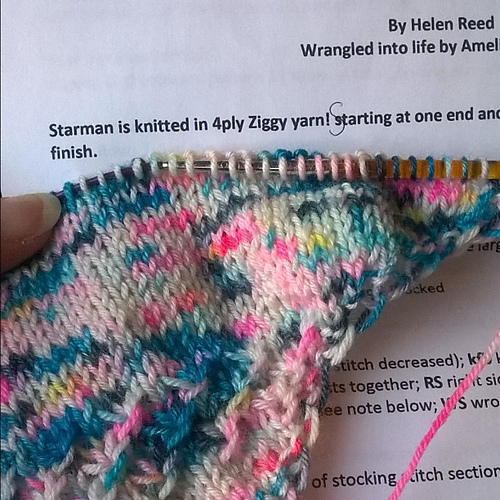 I spent most of the day knitting my Starman test knit for Helen of The Wool Kitchen. I also caught up on some work-related reading. I have realised that I need to keep in touch with what is going on in the office, even if I can’t be there. Otherwise, it will be even harder to go back when the time comes. Thank you for all the packed lunch ideas :) I know that this is the sensible thing to do, but I am finding it hard to be that organised right now. However, tomorrow I need to stop at the shop to get some pear juice for FL (if such a thing exists) and will see what I can find for me while I am there. Oh – and a miracle has occurred! The middle neighbour popped a note through the door with her mobile number, offering to let the dog out if I get stuck in town one night!